This novel came to my hands as a proof copy sent to work by Harper Collins (thank you for the freebie!). It was one of those days when you feel like reading something completely random and the thought of a young Finnish author caught my attention. I know very little about Finland and the cover looked weird enough to give it a go (yes, I do judge books by their covers, ready my post about book covers here). The point is, I had no idea I was in for a literary treat. For some strange reason I always end up reading historical fiction or miserable novels. I am incapable of recommending people a happy book. Perhaps because it’s so difficult to read a good funny book and sad stories tend to bring the best of authors. It’s a mystery. 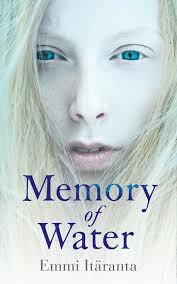 So there I was with my copy of Memory of Water which looked to be a serious read with secrets and intrigue at the core of the plot. Yes please! This is a superb first novel by Finnish author Emmi Itäranta which will leave you thinking about the things we take for granted: water and freedom. The story is set in the near future, at a time when China rules the world and the impact of climate change has left the planet with no seasons and most importantly with a critical shortage of water. Noria and her family are the tea masters of the village in what is called then the Scandinavian Union. They have a special relationship with water; one that brings secrets that are simply and too dangerous to share. Police rations water to all villagers but as it becomes scarce, and after her father’s death, Noria is decided to share the location of a secret spring. The consequences are well, you can imagine… disastrous. If you like Margaret Atwood’s novels, you’ll love Memory of Water and please don’t pay too much attention to the cover and give this novel a chance. It’s worth it!